Lot Detail - Darryl Sittler's 1980-81 Toronto Maple Leafs Game-Worn Captain's Jersey with LOA - 43-Goal Season! - Team Repairs! - Photo-Matched! Darryl Sittler's 1980-81 Toronto Maple Leafs Game-Worn Captain's Jersey with LOA - 43-Goal Season! - Team Repairs! - Photo-Matched! Hockey royalty in the city of Toronto with his historic 10-point night for the Blue and White in 1976, Darryl Sittler dressed for over 800 games for the Maple Leafs, captaining the squad from 1975 to 1981. 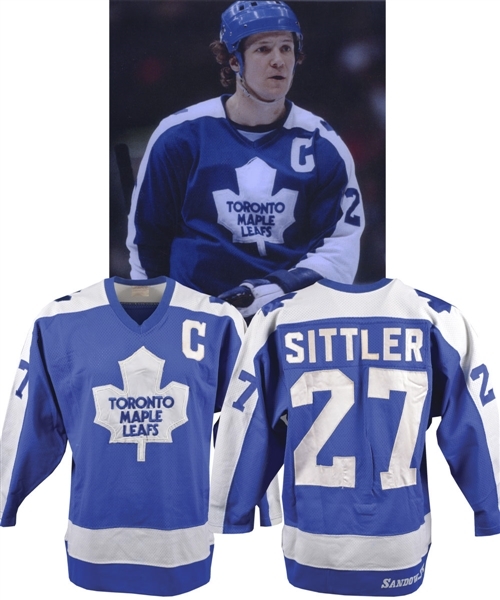 From his final season wearing the “C”, one that witnessed 96 points including 43 goals in 80 games, we have a Maple Leafs captain's jersey worn by HOFer Darryl Sittler in 1980-81, and it’s been photo-matched. A single-year style, a label from Sandow sits affixed to the collar along with a second Sandow logo rubberized over the lower hem, with the vintage sweater measuring-out to approx a size 52. Featuring the famous Maple Leafs team crest with an embroidered inline, the solid blue mesh has been accented with “27” over the sleeves and verso, along with “Sittler” over the affixed nameplate in single blue twill. 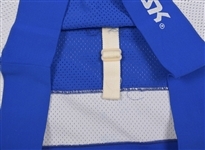 A loop-style fight strap has also been utilized, with a number of team repairs visible, including a pair over the upper part of the team crest, and a pair reinforcing the lower portion of the reverse “2”. A few additional marks are present, with some very minor discolouration over the white section on the lower right sleeve. An LOA along with a COR will accompany from MeiGray. An included numeric image has been matched to; the specific placement of the maple leaf on the left shoulder in correlation with the mesh holes; the two small white loose threads on the lower portion of the "S" of Sittler on the nameplate; a small loose thread on the lower portion of the first "T" of Sittler on the nameplate. 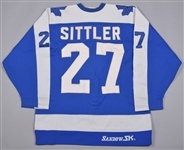 Additionally, a second included numeric image clearly shows the shorter "L" of "Sittler" on the nameplate, while a third included numeric image is showing the tear in the upper left edge of the team crest before it was repaired. There is also an included 8x10 photo showing the tear in the upper left edge of the team crest before it was repaired.